Honestly, it’s not even worth making a joke like “you may have heard of Call of Duty.” Your grandmother has heard of the Call of Duty franchise, it is not just the biggest in the gaming industry, it is one of the biggest entertainment franchises in history. So odds are you have heard of it. Besides, we’ve used that joke before and don’t want to be repetitive. 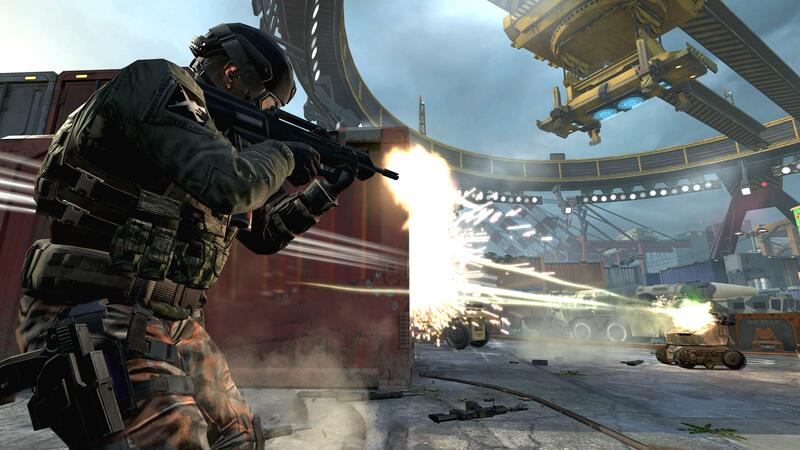 The broad details of Call of Duty: Black Ops 2 have been known for a bit now. The game is set in the near future, and will star David Mason, the son of Alex Mason, a presumed dead supporting character from Black Ops. The world of tomorrow’s military actions will be defined by the advent of technology to fight wars. Unmanned drones will patrol the skies, while mechanized walking tanks will control the ground. It is a reasonable trend, as it will protect the lives of our soldiers. At least until someone else takes control of those systems, and turns them against us. Black Ops 2 takes place in the year 2025, and the worst case scenario has occurred. The US specifically (and presumably the world) is facing a massive attack. Most of the details are still under wraps, but Activision and Treyarch have begun to show off a few sections of the single player story, as well as a new mode called “Strike Force,” which will be a standalone feature, but it will have an effect on the campaign. The demo we saw was the same as that shown off at the Microsoft Press Conference, plus a bit more. The setting of the demo, which takes place about half way through the game, took place in LA on June 19, 2025. The city is under attack from unmanned drones, as well as enemy troops on the streets. The attack is one of several timed attacks across the US. Along with the Pentagon, Washington DC, and Wall Street, the enemy, led by a man named Menedez, planned a series of attacks meant to cripple the country in one blow. The attack on LA was directed at the world’s leadership, which was meeting in LA at the time. The demo begins with Mason guarding the President in a convoy under attack. The drones take out the highway, forcing Mason to step outside and jump on a SAM turret to take out the drones. Once the SAM was hit, Mason was sent scrambling as the truck the SAM turret was on began to fall, and the fight took to the streets. One of the minor changes to the game is that there will now be choices mixed in. In the example shown, Mason can either snip to protect the POTUS, or rappel down and fight on the ground. As the game is set in the future, there will be all new weapons. Most will be familiar with a few tweaks, but there are some — like the new sniper rifle that features and x-ray scope and a power-up shot which can shoot through walls — that are new for the game. The tech in the game is primarily based on real-life weapon development. There is still very much of a slant to the fantastic, but there is a realistic basis for all the weaponry. As Mason advanced down the street, taking out enemy after enemy, they are joined by an FA 38, which can hover overhead, and begins to act as an “armored overwatch.” As Mason continued through the ruins of the city, another new weapon is introduced: the friendly drones. Mason was able to mark areas and send drones to attack that section and take out oncoming troops. Following a firefight in the streets, a skyscraper ahead of the crew began to fall. After a short cut, Mason and his crew headed onward, and found the FA-38, and the wounded pilot. Mason took charge of the plane, and took to the skies to continue the fight. The flight controls seem straightforward enough. The action will take you all over LA, as you fly between buildings and shoot down drones and enemy helicopters. After taking several out, the demo concluded when Mason bailed out second before ramming his plane into an oncoming fighter. The gameplay was smooth and the lauded 60 fps was obvious. The graphics still need a touch of polish, which will certainly happen before the November release date, but the weapon selection seems fresh and unique. 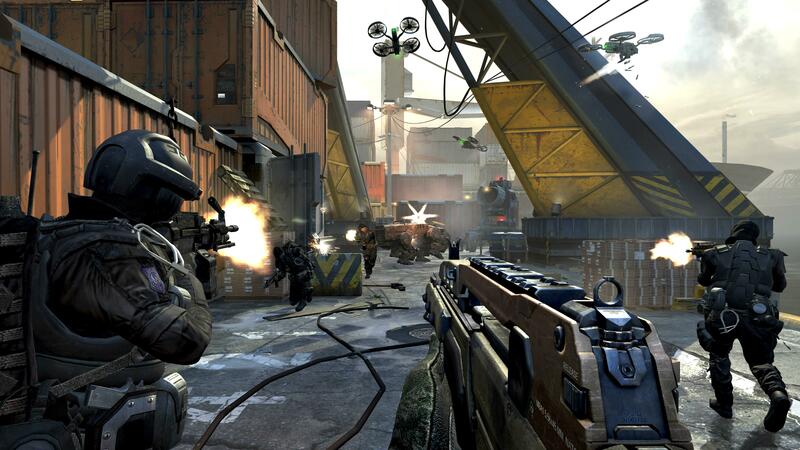 The use of future tech opens up a massive new world of combat for the Call of Duty franchise, and the inclusion of more gadgets and tools seems like a natural one. As for the combat, it was pure Call of Duty. There is a reason why so many others use the same control scheme, it just makes sense. The next thing on display was a new mode called “Strike Force.” Treyarch was tight-lipped on how this factors into the campaign, but it is its own section, and the developer did say that what you do in Strike Force will affect the campaign. The level being shown took place in Singapore, and featured squad based combat. As the primary player, you will be able to move your squad toward objectives in multiple ways, and Treyarch claims there is an open world, sandbox approach to the mode. In this particular demo, there were three points that the team needed to approach and interact with, then hold for a limited time to complete the overall objective of sinking an enemy controlled cargo ship. What makes this mode truly unique is that it is more than just a shooter; it incorporates tech-based strategy. At (seemingly) any point, you can call in a UAV to mark targets and send your squad. You can also take control of offensive machines and attack both enemies and enemy armor before switching back to your standard FPS point-of-view. Once all three points were interacted with and controlled, the demo ended with a missile crashing into the ship and sinking it. How this fits into the overall game is still unclear, but it is an intriguing new look for Call of Duty that felt a touch reminiscent of the recent Ghost Recon: Future Soldier, which also heavily used gadgets, tech, and squad-based play. Expect to hear more about this mode soon. Sadly, as is traditional with Activision, there was no mention of the multiplayer. We do know Treyarch will again bring its uber-popular zombie mode back, but we’ll have to wait and see what changes it has undergone, as well as what we can expect from the online multiplayer. The glimpse shown off looks like the series is in good hands with Treyarch at the helm, and longtime fans will likely be pleased at the fresh new take on the futuristic warfare, which is a slightly new direction for the franchise, but not one that is so alien as to make it feel unfamiliar. The controls and graphics look to be the same as Modern Warfare 3 and Black Ops before that. It won’t win over the haters, but with tens of millions of fans worldwide, it doesn’t have to. 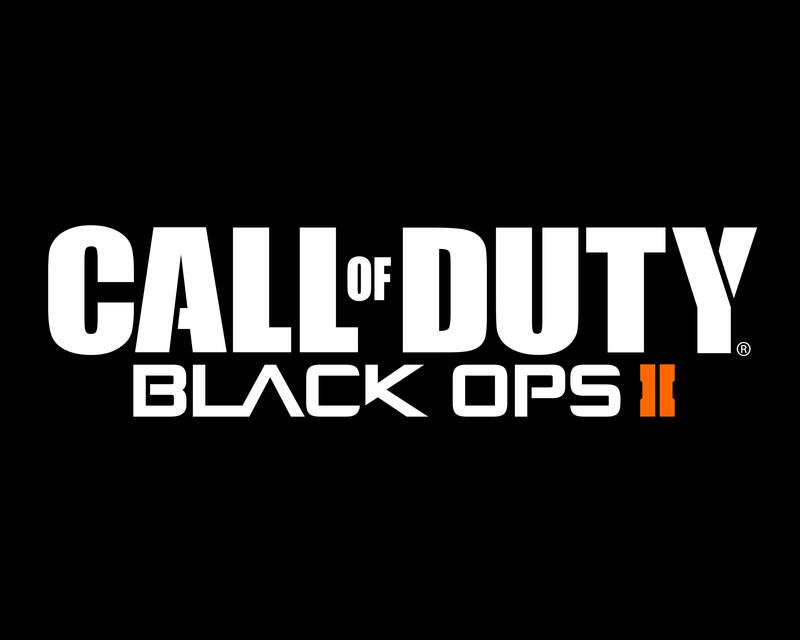 Call of Duty: Black Ops 2 will be released for the PC, PS3, and Xbox 360 on November 13. It will then likely go on to make a billion dollars by the 20th.